Time to Change Wisconsin’s Fence Law? Home / Blogs / Time to Change Wisconsin’s Fence Law? ‘Good fences make good neighbors,’ is an old adage in rural areas. Wisconsin has had the same fence law for more than 100 years. It specifies when and what types of fences are required for adjoining property owners. 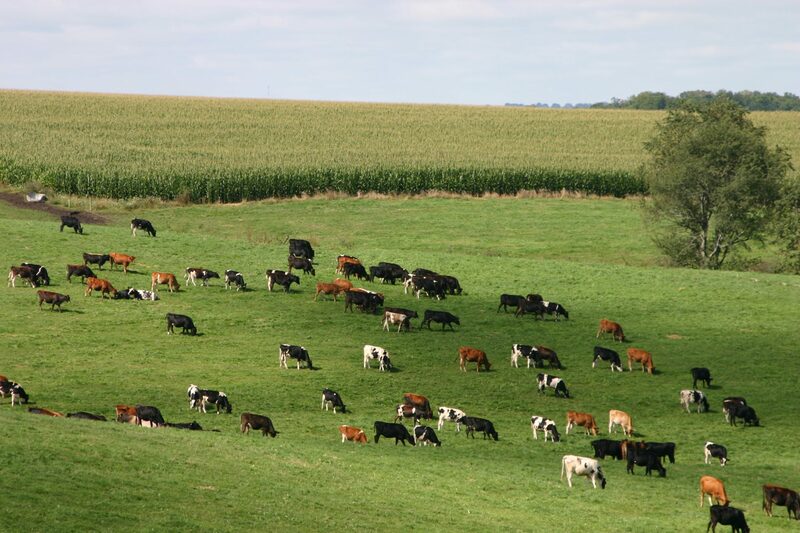 The law states that if property is used for farming or grazing, a fence is required; however, adjoining landowners can mutually agree not to have a fence or to use markers instead. The law states then when a landowner is facing the neighbor’s land, the right-hand half the fence is the landowner’s responsibility and the left-hand half is the neighbor’s responsibility. This provision still applies to farmland bordered by a subdivision. The law prescribes several options for a legal fence. In general, a fence must be 50 inches high and the bottom not more than four inches above the ground; however, shorter heights do apply in specific situations. When adjoining landowners cannot resolve fence disputes, either landowner may contact town board supervisors who are empowered as fence viewers to resolve fence disputes. However, fence viewers are not authorized to resolve boundary disputes. In recent years, there has been increased discussion about changing the fence law. Some rural landowners who are not farming and some non-livestock farmers have raised concerns about its practicality in today’s world. Discussion among Farm Bureau members, rural residents and some legislators about changing the fence law has focused on requiring livestock owners to be responsible for maintaining all of the fences bordering their properties. The Farm Bureau supports the current fence law. It opposes any general requirement that all streams or lakes must be fenced. It also urges the Wisconsin Department of Natural Resources (DNR) to comply with the state fence law. Should the fence law be modified to require livestock farmers to be responsible for maintaining fences to contain their livestock? Should non-farmers be able to require farmers who do not have livestock to construct or maintain their half of the fence? Does the definition of a legal fence need to be modified? If so, how? The antiquated law was in existence at a time when all the folks living out in the country had livestock. It was commonsense that both farmer’s shared equally in maintaining the fence that they both benefited from. However. Today’s country dwellers have changed. One may be a farmer with livestock and the adjoining neighbor may have none. It would be a simple law change that states if “only one owner has livestock, horses, llamas etc…then the animal owning side pays 100% for fence maintenance. At any point, if both landowners have livestock- then both share in the maintenance cost”. It is wrong to apply an 1800’s law when ALL country dwellers had livestock to today’s occupant. The issue of a fence marking boundaries between parties is a separate one and should not be confused with the wider controversial situation above. In the past 5 years, we have had to pay $3,000 for maintaining the fence to benefit my neighbor’s cattle business. We have no livestock. It is not only inappropriate, but costly to us. If we are “sharing in his business expenses”, then perhaps, we should also share in his revenue? Clearly the law should be changed! The general fence law should not be changed. It sounds all nice that farmers should be solely responsible for fences should they be the only ones with cattle on their property. But what happens when one person has cattle on their property for 90% of the year, and the other lets their cattle in just long enough to eat the grass down? The bottom line is that the general fence rule minimizes disputes between landowners. Then whoever owns the tree that falls on it and destroys any section is responsible for fixing it or paying their neighbor the time and materials to do so. The idea of changing it is like the restrictions that are placed on farmers near many residential areas where they can’t work after a set time, often as early as 8PM! If we were restricted to only working 8-8 in our fields we wouldn’t be able to get done in time when the weather isn’t cooperating. When you buy property, it is your responsibility to be a good steward of the land. If your neighbor wants to put a fence in, you should pay for half the cost so he isn’t solely responsible for clearing a fence line that you’ve neglected simply because it’s unimportant to you whether it’s overgrown with trees or not. Are you tired of his cattle getting into your property? Share the cost because it’s both your problems. We own plenty of ground where the neighbor needs it fenced but we don’t. Yet we understand that as property owners you share responsibility for proper maintenance of the ground. We also have many neighbors who let their trees overflow the fence, then when a tree falls after a storm, we’re still getting calls about our cattle. Yet, we still can’t hop the fence and kill any trees within 50 feet of it without being sued. Sorry, but it’s a shared responsibility. The general fence rule encourages all landowners to do what they can to prevent damage to the fences, and it should stay that way. Yes law needs to change immediately. If a farmer is using it for grazing or farming and the residential property owner does not need nor require the fence and chooses not to have it then, the farmer should be responsible for maintaining fence. If residential property owner is destroying the fence, then yes they should pay for it. But if trees are growing in fence that is an act of God and farmer should be responsible for up keep on the fence that he needs or chooses to have. Yes, time to change the law! We as owners of property that is not used for grazing or crops and is heavily wooded should not have to pay for a fence to contain the neighbors animals. Our land is not suitable for grazing so why should I pay for fencing to contain animals? I’m in favor of half and half, livestock owner or not should have nothing to do with it. I want to know where my boundaries are. It should be fenced so it is clearly identified. Maybe, instead of requiring the fence to be around the entire property — it need only be around the areas used for penning the animals, regardless of what the penning reason is (grazing, holding, whatever). This way, it does not “have” to be on the outside perimeter, it does not “have” to be seen by your neighbors necessarily, you don’t have to worry about your neighbors trees falling on it, nor them having to maintain it. I have pastured cattle. On all of my interior fence it’s necessary for me to clear trees back to keep them from falling on my fence. On the boundary fence, however, my neighbor’s trees have fallen over on to my fence requiring me to repair it. On one occasion my cattle got out through such an opening and caused damage to my neighbor’s property. Not only do they not want to trim their trees back, they want me to pay for landscaping to repair damage. I think they should have to pay for their tree falling on my fence. In this case, current Wisconsin fence law is appropriate. last year purchased 180 acres of of land. Yesterday an adjoining land owner called me and told me there were trees down on the fence line between our properties and I would be required to repair the fence. He was pretty insistent that i repair it right away because he wanted to get his cattle in there. I don’t have livestock and do not intend to have them in the future. I don’t think i should have to “subsidize” my neighbors livestock farming. It’s time the law is changed. manure and its nitrogen and phosphorous load out of the watershed which eventually reaches the Gulf and causes the Dead Zone. it is about limitting nutrient pollution whether that was its original intention i dont know but its a good thing. I agree with Joes comment above. I have 20 acres of land that I use for hunting. I plant food plots for deer and my neighbors cows continuously come onto my property every year and he tells me that I am responsible…… I don’t have cattle, why should I be responsible for another land owners cattle???? If someone has livestock, they should be responsible for full containment. Half of their problem should not be foisted off on their neighbor. Seems simple. The fencing of streams and lakes doesn’t make sense to me. Is that from an ‘attractive nuisance’ standpoint? So then require fences around fruit trees? Nope….